Boko Haram terrorists at a base of the Nigerian Army at Borno, as latest details reveal the death of security officials has risen, while others are still missing. News received by PREMIUM TIMES have been revealed that at least 113 soldiers were killed in the pre-dusk attack on 157 Task Force Battalion at Borno State on November 18. The newspaper also said that 153 soldiers are still missing in action as of November 24, nearly a week after the attack. Those killed included the commander of the battalion, a lieutenant colonel. It has now been learned that the second-in-command to the commander, the intelligence officer of the battalion and two other officers killed by Boko Haram in the attack, which occurred at about 6:00 p.m. last Sunday. On November 22, a soldier who escaped the attack and witnessed how his colleagues were killed by insurgents revealed that 70 bodies had been confirmed. Some media reports, including one by London-based newswire, Reuters, cited sources as a result of the insurgents in the attacks. But PREMIUM TIMES has now learned from top officers that the casualty had risen significantly to 118 soldiers, comprising 113 soldiers and five officers. 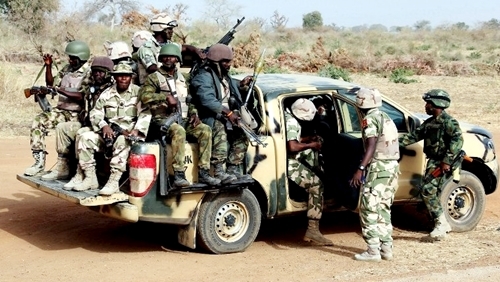 Sources thus confirmed 153 soldiers are still missing in action, and wounded troops have been evacuated to Maiduguri, the Borno State Capital, for treatment. President Muhammadu Buhari reportedly summoned service chiefs over the attack. He also dispatched Nigeria's defense minister Mansur Dan Ali to Chad Republic, a neighboring country on whose borders the Boko Haram has seemed to waxed stronger in a recent month.